Crispy breading and creamy gravy — those are just a few things you can look forward to on October 26 when you celebrate National Chicken Fried Steak Day. It’s a Southern cuisine classic. Texas first decided to carve out a Chicken Fried Steak Day in 2011. So break out your deep fryer, get your gravy ladle ready, and get excited to have a full belly of Southern goodness. ​The “Lamesa Original Chicken Fried Festival,” an inaugural celebration in Lamesa, Texas, marked 100 years since the recipe was invented there. ​Oklahoma made chicken fried steak — among other dishes — part of its official state meal. ​The Los Angeles Times printed a recipe for chicken fried steak. ​Jimmy Don Perkins, a short-order cook in Lamesa, Texas, accidentally created chicken fried steak (at least this is one theory). Now, you may think our brain is fried, but what better way to celebrate National Chicken Fried Steak Day then taking a trip to Texas or Oklahoma? For a Texas trip, be sure to check out the Gristmill River Restaurant, Blue Bonnet Cafe, or Barbecue Inn. For Oklahoma, try stopping by Cheever’s Cafe, Tally’s Good Food Cafe, or Kendall’s Restaurant. Never made chicken fried steak? Well, National Chicken Fried Steak Day is the perfect time to do so! Decide on a recipe (pan fried or deep fried?) and which gravy you think you’d prefer — and do your best to create a Southern favorite. Whether it’s your first time making chicken fried steak or you consider yourself a pro, celebrate National Chicken Fried Steak Day by having a cook-off. Have friends and family come over — armed and ready to fry up chicken fried steaks — and see whose recipe comes out on top. ​Well, as the name suggests, frying is a given, but what's the best way to do it? Some enthusiasts will argue that frying in a pan is the only way, but those who deep-fry say their way is best. 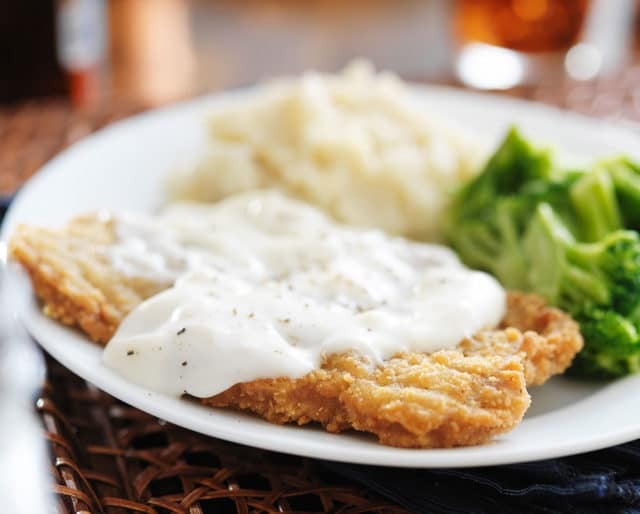 ​The two most common sauces to choose from for chicken fried steak is a white cream sauce or a brown gravy sauce. Die hard chicken fried steak eaters will (happily) debate to the death why theirs is the best one. ​Mashed potatoes as a side dish are a given when it comes to chicken fried steak, but many people also enjoy it with collard greens, grilled corn on the cob, fried okra, green beans, and spinach — just to name a few. The crunchiness of the chicken, the creaminess of the gravy, and the butteriness of the mashed potatoes. Yes, please! Well, these are all the things you’ll get in a forkful when eating chicken fried steak. And thanks to National Chicken Fried Steak Day, you have an excuse to eat as many forkfuls as you’d like — we won’t even judge you if you lick your fingers when you’re finished. Unless you live in an area where chicken fried steak is a common cuisine, the odds of ever eating it — or enjoying it frequently — are probably slim. Thankfully, National Chicken Fried Steak Day not only gives you an excuse to indulge, but it also serves as a reminder that there are other cuisines out there — in this case Southern cuisine — that may be outside of your usual food choices. Since it’s protein it’s kind of healthy, right? Okay, this may be a bit of a stretch, but it’s also kind of true. Sure, fried anything may not be the most healthy thing in the world, (everything in moderation, right?) but at least you know you’re getting some protein on October 26. Plus, National Chicken Fried Steak Day only comes once a year, and if this is the one day where you splurge on a fried food, then it’s worth it.